In 1988 Jack Roush decided to move his racing operations south and foray into the growing, but unfamiliar world of NASCAR. Already an accomplished drag and road racer, NASCAR was exciting, but unchartered territory for the former Ford engineer and college physics teacher. The move proved to be very successful. Roush has built his team into one of the most successful in the history of professional sports. Roush’s teams captured multiple championships, in all three of NASCAR’s major series, while taking home over 400 checkered flags in the process. 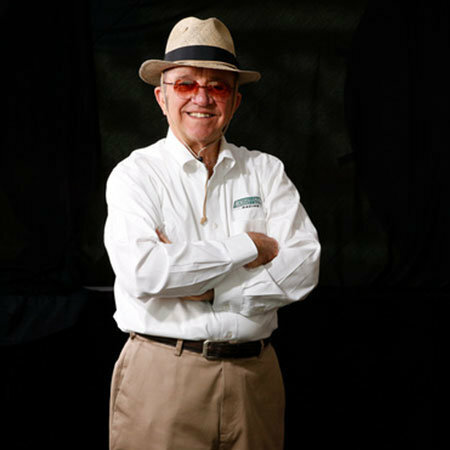 Born in Covington, Kentucky in 1942, Jack Roush was always interested in finding out what made things tick. He received his mathematics degree with a minor in physics from Berea College in 1964 and moved to Detroit to go to work for Ford Motor Company that same year. He went on to earn his Master’s Degree in Scientific Mathematics from Eastern Michigan University in 1970. While working for Ford Motor Co., Roush was drawn to the company’s extensive motorsports activities, and in 1966 joined a group of fellow racing enthusiasts called “The Fastbacks.” After leaving Ford, he partnered with Wayne Gapp in 1970 in a racing venture that would see the duo attract national attention by winning several events and one championship each in NHRA, IHRA and AHRA with their Pro Stock racer. In 1988, Roush launched his first NASCAR Cup team with driver Mark Martin. In October 1989, Roush and Martin claimed their first NASCAR Cup victory at North Carolina Motor Speedway and the two would go on to form one of the most successful partnerships in NASCAR history. Jack Roush joined forces with Robert Yates to form Roush Yates Engines in 2003. The engine shop, based out of Mooresville, N.C. is the exclusive NASCAR engine builder for Ford Performance and manufacturer’s engines for Roush Fenway Racing, Team Penske, Wood Brothers, Stewart-Haas Racing, Front Row Motorsports and Go Fas Racing. Roush also heads up ROUSH Industries, Inc., which employs more than 1,800 people and operates facilities in five states, as well as in Mexico and Great Britain. Although primarily known for providing engineering, management and prototype services to the transportation industry, Roush has developed a significant role in providing engineering and manufacturing for the electronics, sports equipment, aviation and motorsports industries. For more than 50 years, Roush has been committed to winning on and off the track. He is one of professional sports; premiere owners, with championships in all three NASCAR series. Roush Fenway Racing exemplifies tradition and success and is poised to continue their winning tradition well into the future.